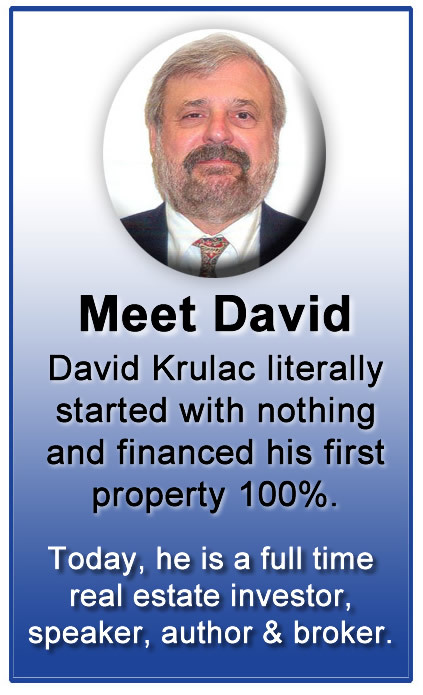 David Krulac's down-to-earth delivery of his true life experiences in Real Estate is well worth the price of the book. If you seek the truth about Real Estate investing and wish to benefit by lessons that were earned honestly and in the context of "the old fashioned way", then you should buy and devour this book. Real Estate Explained by a Master! Written in an entertaining, conversational tone, David shares the hands-on knowledge of a true expert. This information-packed guide explains what you REALLY need to know. It's organized so that you can go back to a specific chapter to re-read details and compare one deal with another one. Because How I Started... is easy to read in a friendly, chatty manner, Krulac makes it fun to learn and keeps you moving through the chapters. Enjoy reading this wonderful book! I loved reading it - and learned so much! This is a great book -- one of the rare real estate investing books to go beyond theory and actually take you step by step through the deals that have made an investor wildly successful. It's a rare peek into the world of a successful REI business. You can learn a lot from the author's thinking behind each transaction. A great addition to any RE investor's library. A MUST READ FOR ANY INVESTOR! David takes you through his real life experiences and gives you solid details on each deal he has done. As a seasoned investor I was able to learn new information that will be useful to my future in investing! The value of this book should be worth far more than it's selling for. I look forward to reading future books this author produces! Don't think twice about adding this book to your collection it's a fantastic read! As a seasoned real estate investor, I have read many books. This book is a refreshing exception to the "all fluff and rah -rah" that fills many other books. I especially like the "lessons learned" part of each real estate deal. Lots of "nuggets" that would have never occurred to me. It's been said , There are two ways to learn, mistakes or mentors, well, I have made mistakes, David's book is in the mentor category, Big Time! Of all the Real Estate books I have read, this one by far exceeded my expectations. It is the first RE book I am not skipping through "rah rah" sections or some other gimmicky fluff. There is value on every page. I am thoroughly enjoying this book. Love the way each chapter is laid out, consistent and no fluff. The writing style makes it very easy to absorb and flow through the chapters. The author does not dress anything up. He is matter of fact, straight to the point and entertaining to read. I especially love the end of chapter outlined review sections and the "In a nutshell", which outlines the specifics of the deal. I can see this as a great reference book in the future as I get more involved with RE. Mr. Krulac clarifies from the start, some deals you just won't be able to duplicate. He has even tried and been unable... Life's circumstance always has a different flavor when it comes to opportunities for each of us. By reading through his broad range of experiences, I believe helped to open my eyes to see opportunity (past and present) in my own life, with its own unique variables. Thank you Mr. Krulac for a valuable contribution to this industry and a great learning tool! Best wishes. Reading is what I have loved since I was very young, Real Estate is what I love to do for a living. However, I don't enjoy many books written about making money in Real Estate. Usually they are full of pretension that puts a glaze over my eyes and my mind wanders to someplace else. This book is completely different. It's real, it's succinct, and very easy to read. Excellent format, well written with economy of words that belies the helpfulness of its solid content. In short, I truly liked this wonderful book. Great job Mr. Krulac, very well done! What I love most about this book is it is real. Real case studies, real houses, real numbers about the authors adventures in real estate. Everyone can learn from case studies and I highly recommend you check this one out! I have written two books myself about real estate investing, and I know too well how hard it is to write a good book, and how to present knowledge in a way that it really can help the reader. Kudos to David for laying out for his readers a down to earth "how he did it and how they can do it" vision. David's book offers value to both seasoned and new investors. Again, great work David and wonderful that you are sharing some of your secrets with your fellow investors. 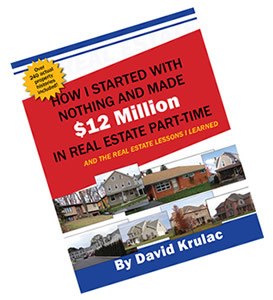 Real Estate Investing "must have"
David has done it all - everything from cheap houses to tax sales to HUD repo's to foreclosures - and everything in between. Through 124 completed real-world real estate transactions, he shows you exactly how he did it step-by-step and how you can do it too. This is a big, meaty book full of real estate lessons, and it should be part of every real estate investor's library. 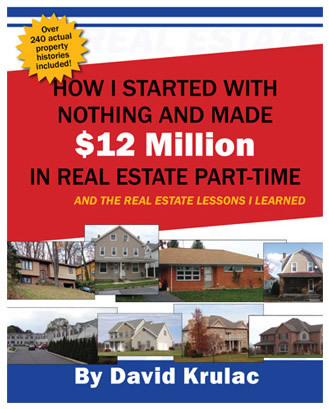 I highly recommend "How I Started with Nothing and Made $12 Million in Real Estate Part-Time" and suggest you get your copy today.